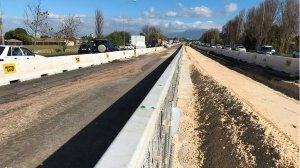 The R487-million project to upgrade a section of the N1 between Plattekloof road and the Old Oak interchange is 58% complete, the Western Cape Department of Transport and Public Works said in a statement on Wednesday. As one of Cape Town’s busiest roads, about 120 000 vehicles travel along this stretch of road during the morning inbound and afternoon outbound peak periods. The addition of a third lane in both directions will significantly reduce traffic congestion and the project is expected to be completed by April 2019. The Freeway Management System, fibre-optic bank and Wemmershoek pipeline installation is complete, as is the Old Oak inbound onramp, the Plattekloof road interchange and the Phase 1 widening of the third lanes in the median. Work in progress includes the rehabilitation of the pavement on the N1 carriageways, Phase 2 median widening and installation of the concrete median barrier, widening of the inbound auxiliary lane, from Durban road to Jip de Jager avenue, as well as widening of the Jip de Jager avenue interchange and ramps. Further, the work currently being undertaken will also see the construction of the Old Oak West Bridge, the construction of gabion retaining walls and the upgrade of the intersection at the Durban road interchange. “Daily closures are required on the main carriageways for milling out existing surfacing and laying new ultra-thin friction course surfacing. There will be closures on the outbound carriageway until the end of August, again from mid-November until mid-December, and then again from mid-January until the end of February 2019,” the department said. There will also be closures on the inbound carriageway from the end of August until mid-September, again in the first two weeks of December, and then again from mid-January until mid-March 2019. “The Old Oak road West Bridge was demolished in May 2017 to make space for new lanes on the N1. The reconstruction of this bridge will cause some discomfort to road users until its completion, which is expected in October 2018. “In the meantime, the Old Oak road East bridge is carrying all northbound and southbound traffic,” the department said.